The past 10 days have been quite a ride. One that I'd like to not repeat oh how about ever. Last Thursday after picking Logan up from daycare I started feeling not very good. Marty was helping out at a track meet and I texted him to tell him...and 30min later I called him to let him know that he needed to come home right away. If you read Marty's blog, you know that we were hit with a nasty stomach bug. Imagine the worst stomach bug ever and that's what we had. Marty followed suit a few hours after I started. Friday we were both totally incapacitated. aAlthough the violent parts of the bug were over, We were both just wiped out. Luckily, Logan didn't get what we had and he was very chill on Friday and slept most of the day. Saturday we were both feeling much better although neither one of us had an appetite. We still put on a swim clinic at TAC. Logan started a bit of a cough. One week at daycare and kid is already sick. Sunday we both got our appetites back. Logan's cough got worse. He also seemed to have lost his voice as when he cried barely anything came out. It was the most pathetic thing ever. We called the doctor and they told us we could give him some children's tylenol for his discomfort, but other than that, just keep feeding him. Monday he seemed worse. I worked from home and Marty and I took turns watching him. We ended up making an appointment for him, but again, there wasn't much that could be done for such a young baby. You could tell he was pretty miserable, and his weight was now down to the 27th percentile (he had been at the 50th percentile at his 2 month checkup). Tuesday morning he seemed about the same, but I couldn't stay home from work again, so off to daycare it was. When I picked him up, though, he had really gone downhill. He was pale and his eyelids were red and he was just sort of listless. He was having trouble breathing and they said he wasn't eating well. I called the doctor again, but it was after hours so I had to wait for someone to get back to me. 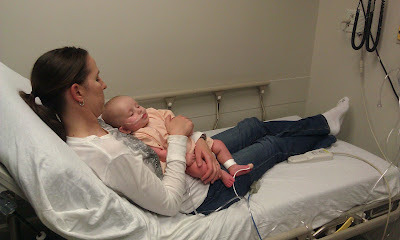 When the doctor called, he said it sounded like RSV and we should go to the children's ER. Off we went. They tested his snot (yup) and he did in fact have RSV, which is a super common respiratory virus. We all get it: kids, adults - it's everywhere. In babies, it can be very hard because their immune systems are so immature and their lungs are small. They gave him a breathing treatment but his oxygen saturation was still lower than what they would like, so they admitted him. We were there from Tuesday evening to Thursday evening and as you might imagine, Marty and I were exhausted by the end of it. 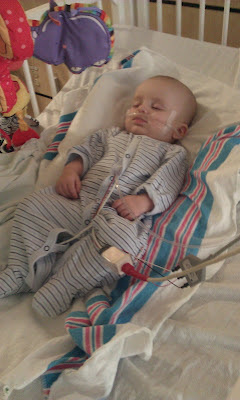 Logan is fine - they had him on oxygen and regular breathing treatments. It's what they call 'supportive care' as it's a virus and really you have to let it run it's course. He still has a wicked cough but is much happier. Our biggest issue at this point is the coughing fits sometimes enact his gag reflex which causes a fountain of milk (pretty much everything he has drunk) to come back up. He lost more weight when I went to see the pediatrician on Friday. We're hoping he can keep most of it down so he can get back up to his normal weight. Needless to say, I didn't end up doing the triathlon this morning I had planned on. Not only was I way tired, but my calf has been giving me problems and I really haven't been able to run for 2 weeks. Here's hoping this next week is better. Also, I still haven't seen The Hunger Games and I really, really want to. That sounds awful. Sounds he is on the mend though so that is good. SHEESH, mom's have to worry a lot. Oh poor guy!!! Hope you all feel better and get back to normal soon! Poor guy. RSV can be so scary. What a truly rough couple of days. Glad you are all on the mend. And I wish I could tell you all the germs from daycare stop soon, but I swer it never does. Hopefully all the exposure pays off in kindergarten. What a nightmare! Glad to hear your little guy is doing better now. I am getting a kick out of your blog lately, as I had my baby just a couple months after you did; I like to read and get a rough "sneak preview." Sorry to hear it Bri. 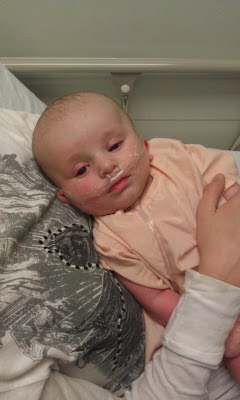 Brayden's coughs end up with vomit to this day...that and when he starts to laugh and hiccup...vomit again. Odd. Here's to a better week both physically and emotionally. Sending you guys positive thoughts and lysol dreams.